If you love spicy food, you're probably well aware that your nose runs and your eyes water when you eat it. In fact, you may eat spicy food when your sinuses are congested in the hopes of finding some relief. 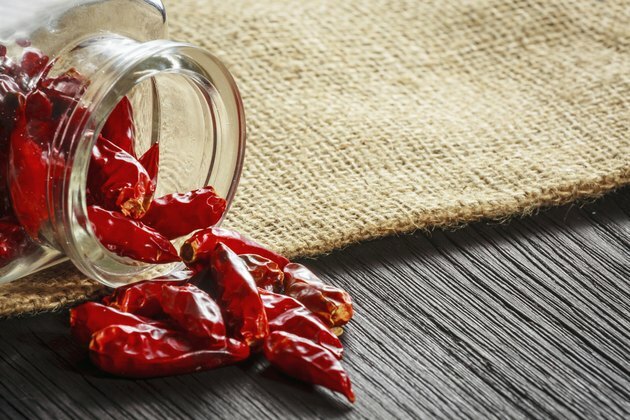 Some spicy foods can help you clear a stuffy nose. However, hot foods don't always have the desired effect and may actually aggravate sinus problems. If you have persistent trouble breathing, it's best to forget about eating spicy foods and instead consult a doctor. You may have a sinus infection that requires an antibiotic. Some hot and spicy foods can relieve sinus congestion because they help to keep your mucous thin, according to "What Your Doctor May Not Tell You About Sinusitis," by Alan R. Hirsch. Keeping your mucous thin can also help you prevent a sinus infection, according to MedlinePlus, a service of the U.S. National Library of Medicine. MedlinePlus recommends drinking plenty of fluid, using a humidifier and saline nasal sprays for this purpose. Foods with mucokinetic, or mucous-thinning activity, include chili peppers, garlic, horseradish, black pepper and curry spices. Other foods not normally considered spicy include mustard, onion and thyme. Garlic has an active ingredient called n-allyl thiosulfinate, which is short-lived decongestant activity, M. Eric Gershwin and Gary Incaudo write in "Diseases of the Sinuses." The capsaicin in hot peppers has also proven effective in nasal sprays. However, when it comes to actually clearing your sinuses, most spicy foods such as horseradish are backed by anecdotal, not scientific, evidence, according to Gershwin and Incaudo. Spicy foods don't always help with sinus problems. In fact, they can aggravate sinusitis, which is the inflammation that occurs when you have a viral, bacterial or fungal infection in your sinuses, according to "Nutrition Almanac," by John D. Kirschmann. Spicy foods also may trigger or aggravate vasomotor rhinitis, a condition that includes constant runny nose, sneezing and nasal congestion. Though it resembles allergies, this is a nonallergic condition. Numerous factors may contribute to vasomotor rhinitis, including airborne irritants, environmental changes and dietary factors like alcohol or spicy food.